What's So Convenient About Convenience Foods? Not Much. Home /Food, Frugality and Finance, Health and Diet/What’s So Convenient About Convenience Foods? When I was a kid, my family was fueled by convenience foods. 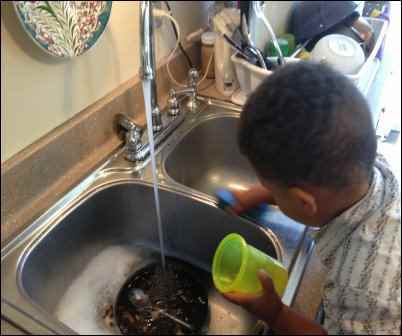 With two working parents, the idea of coming home and preparing a full dinner was a daunting one. By the time I entered high school, the hum of the microwave was the theme song to my kitchen experiences. Everything was microwaved; from my pancakes in the morning to my chicken pot pie in the evening. If I wanted a snack during my evening studies, the microwave delivered popcorn and Hot Pockets on demand. This was more than twenty years ago, before the modern food movement gained mainstream attention and the obesity epidemic was something spoken about only in medical journals. Now, we are in an age where people are looking to deconstruct their over-processed lives, and I think it is an excellent time to challenge the ideas around food and convenience. Are frozen pizzas easier and faster than pizza made from scratch? What about that old TV-dinner standard, the turkey dinner? Does it truly take less time to microwave dinner for your family than to make it by hand? The answer, on both counts, is no. The burden of home-cooked food is a marketing myth designed by the food companies to turn us away from natural whole food and towards their over-processed Frankenfoods. 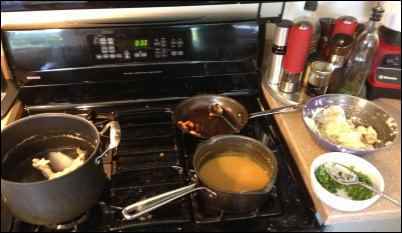 In this article, I will put myself and my fairly average cooking skills against the clock to prove so-called convenience foods fall conveniently short of their promise of good food in less time. For the sake of this exercise, let’s assume we are cooking for a family of four. Let us also assume that we are buying all of the ingredients and convenience foods from the same grocery store. This will allow us to put the travel time and gas needs of all the food on the same level. I will break the cost of the whole food down by the ounce to give an accurate account of the expense of the whole food versus the processed food. Lastly, let us assume that herbs, spices, oil, etc. are something generally available in all kitchens and do not need to be included in the price. So, let us begin. If you’re like me, you grew up eating pizza in one form or another. It is a food that is synonymous with American childhood. Pizza Night was a frequent occurrence in my house growing up, and when it came to frozen pizza, Tombstone brand frozen pizzas were standard. My mom always pulled the pizza out with a flourish and ask, “What do you want on your Tombstone,” in a horrible Western accent. The flat, rock hard, cracker-like pizzas were the cornerstone of homemade pizza for me, and it wouldn’t be until I had a family of my own that I learned that homemade pizza can be so much more than the folks at Nestle` led me to believe. When it comes to comparing homemade pizza in terms of convenience, let’s address the biggest issue first: the dough. Pizza dough takes a long time to make. You have to mix up the ingredients, let it rise, punch it down, and let it rise again before you can even start rolling out your pie. This takes hours. One way that frozen pizza companies like DiGiorno and Frechetta try to address this issue is by adding a bit of chemical leavening to their dough, like baking soda or powder, which don’t need the time to rise like yeast. This works to an extent, but the resulting dough has a cakey texture that does not really feel like pizza. The key to making this process convenient is a bit of forethought: make the dough in advance. I know this sounds simple, but it takes about five minutes to mix up a batch of dough. Once you mix it, you can leave it out on the counter overnight to rise. In the morning, simply punch it down, wrap it in some plastic wrap, and stick it in the refrigerator. Your dough can sit there for up to a week, just waiting to be used. The wonderful part of this method is that as the dough sits in your refrigerator, it gets better. While the dough is in the ice box, the yeasts slowly ferment the sugars in the flour starch, creating thousands of small gas pockets that will make your dough rise in the oven when the heat expands the gas. In addition, enzymes in the flour are given a chance to develop that luscious flavor and texture found in popular gourmet pizza chains. Many of these restaurants use the same technique to improve the quality of their pizza dough. If you want to save your dough for longer than a week, give it an extra wrapping in plastic and stick it in the freezer for up to a month. When you think you might want a pizza, pull it out of the freezer in the morning, and it will be ready to use by lunch. When you put these fresh ingredients next to the Tombstone pizza in all its plastic wrapped glory, it’s pretty clear which will come out the better pizza. Since my dough was made the night before, I preheated the oven to 400 degrees and placed the tombstone pizza inside. According to the packaging, it takes 20 minutes for the tombstone to finish cooking in the oven. This gives me 20 minutes to prepare and cook my pizza. 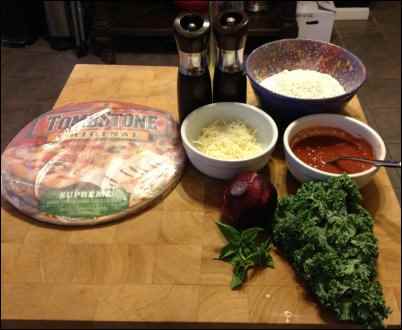 First, I rolled out my pizza dough and add my crushed tomatoes, sliced onions, kale, cheese, and basil and added salt and pepper to taste. I then placed my pizza into the oven right above the still-cooking Tombstone. By the time the 20-minute timer went off, both pizzas were ready to take out of the oven. The pizza on the left is the tombstone pizza. 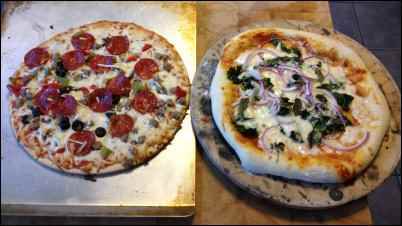 The pizza on the right is the homemade pizza. The knife I used to cut the onions is missing from the picture, but this is not an inconvenient amount dishes to clean up after such a wonderful meal. The turkey dinner is the first truly American meal. Some people call it THE American meal. It represents hours of preparation, care, and timing. The ritual behind the carving of the turkey is something that has been passed down and enjoyed since the turkey became our go-to food for holiday celebrations. 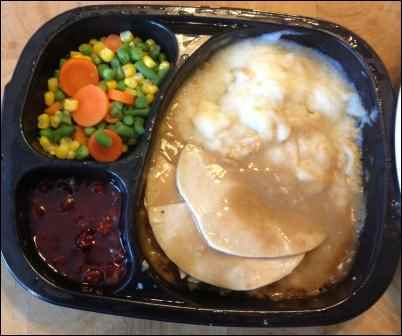 It is no surprise that the makers of the first TV-dinners sought to recreate that spirit when the first began marketing turkey TV-dinners to the public. Today, microwave turkey dinners are alive and well, and for $3.29, the good people at Hungry Man offer a turkey dinner that will “Satisfy Your Craving” in just nine minutes. This means that if I want to satisfy my craving for a fresh turkey dinner for four in the same time, I have thirty-six minutes to do it. My first step was to hit the timer. Then, under the doubtful gaze of my wife and mother-in-law, I set two pots of water to boil and lit the grill. I chose the grill to cook the turkey because the direct heat would cook the breast quickly, searing the outside to provide extra flavor. Into the first pot of water, I dropped the turkey bones and halved onion with a large pinch of Kosher salt. I then chopped the potato into small cubes and dropped them into the second pot with some salt; cutting smaller cubes will help the potato to cook in less time. 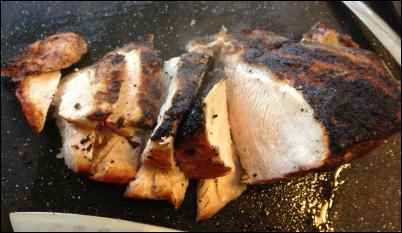 Next, I tossed the turkey breast onto the grill and returned to the kitchen chop the apple. The chopped apple and the dried cranberries went into a small pan to simmer with a cup of water and a tablespoon of sugar. At this point, I had a few minutes to lean back and listen to the radio before the potatoes were soft. I scooped the potatoes out of the boiling water with a slotted spoon and placed them into a bowl. 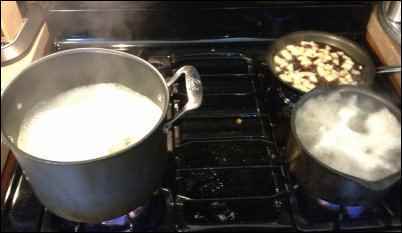 I then dropped the string beans and peas into the pot the potatoes had just vacated and mashed the potatoes with a pat of butter and a splash of cream. By then, it was time to turn the turkey breast on the grill. Returning to my turkey pot, I removed the bones and the onion, whisked in a chicken bouillon cube and an ounce of flour (the cost is negligible for this amount of flour), and let simmer to thicken. 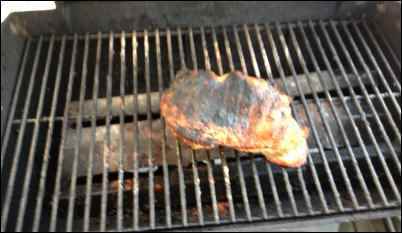 Then, it was time to take the turkey breast off the grill to rest. Next, I added a little salt and pepper to my gravy and strained the peas and beans. 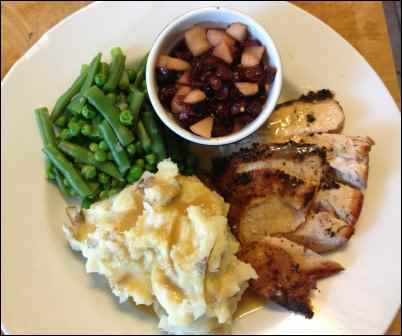 The mashed potatoes were smooth and creamy, the gravy was rich and silky, and the fruit compote was fresh and tangy. In the end, it took me 35 minutes and 46 seconds to create a turkey dinner for four; fourteen seconds faster than it would have taken to microwave four Hungry Man turkey dinners. Take a look at the two here. Which one would you rather serve to your family? At almost half the price, it is clearly cheaper to buy the microwave dinner, so chefs at home will have to weigh the economic value versus the nutritional value. The cleanup on this meal was not overwhelming. A knife and cutting board needed to be washed in addition to the pots and bowls pictured here. 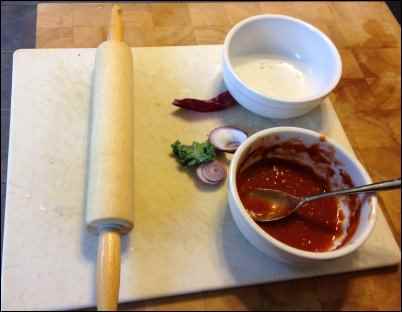 Cooking at home is often about creativity. We have to eat every day, and some days we have less time than others. Commercially developed convenience foods are not so much about saving time as they are about liberating us from thinking about what we eat. The message from the food companies is that their foods are fast and nutritious; you can show your family you love them without slaving in the kitchen the entire afternoon. The image of the family dinner taking half the day to prepare is a fantasy the food industry created to entice us to buy their high-calorie, nutrient deficient food. As I have demonstrated here, in the same time or less than it takes to prepare frozen convenience foods, the cook of the family can produce exceptional, high-quality food that can be fun and exciting to prepare. I encourage you to approach all meals with this spirit. A friend’s mother once told me, “The time you spend on your food reflects the time you spend on your life.” For this discussion, I would suggest that the quality of your food reflects the quality of your life, so go forth, get creative, and don’t worry about the cleanup. That’s what the kids are for.